Local mountain, ski resort, hiking paradise, family adventure - the Schmittenhöhe high above Zell am See is a real multi-talent when it comes to unforgettable holidays. AThe Schmitten is known as one of Austria's most beautiful panoramic mountain and the views across and down to the valley are really quite something. You either look into the valley, across Lake Zell or the town or your attention is drawn to the vista in the distance with up to thirty 3.000 metres high mountains in the Hohe Tauern National Park. 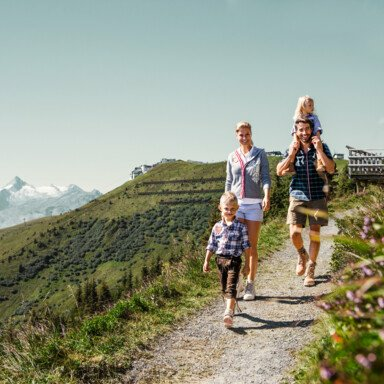 A variety of ski pistes in winter, a large network of hiking trails in summer, family highlights throughout the year; but enough said, see for yourself! The Schmittenhöhe shows its real holiday competence in winter. If you have made the right decision and have booked your holiday in Zell am See, then you will enjoy a special feature of Zell am See. Out of the hotel, onto the mountain and off into the winter sport paradise of the Schmittenhöhe. 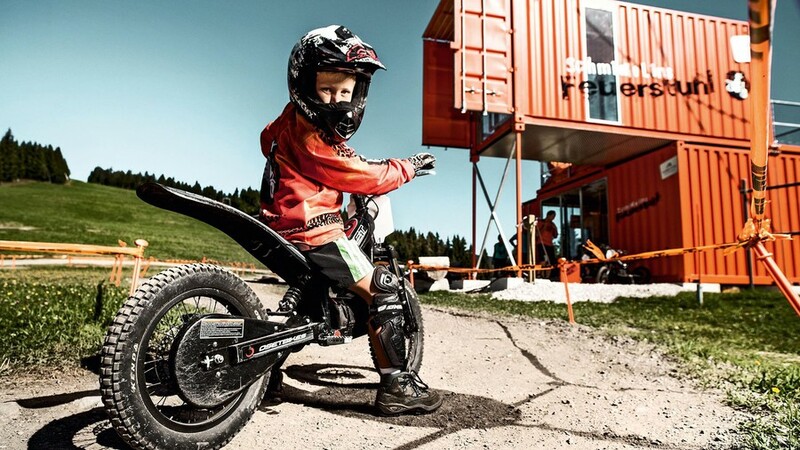 Without car, without stress and with the best range of winter sports you can imagine. 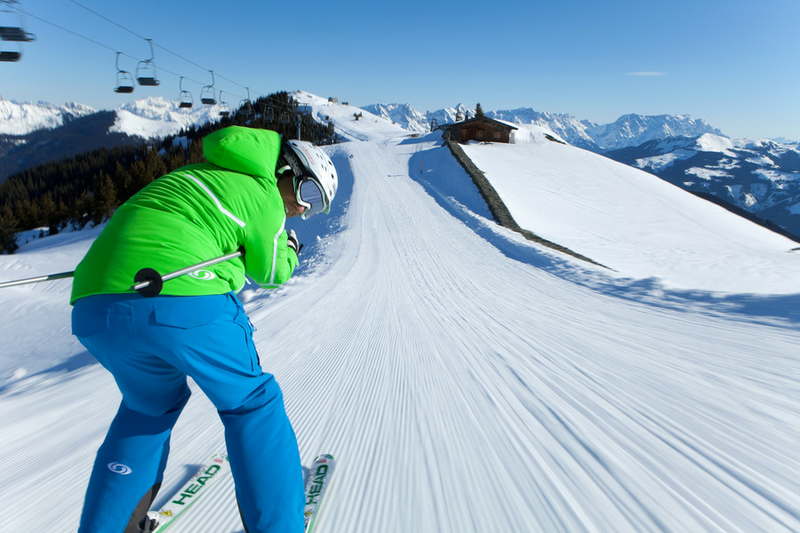 The Schmittenhöhe offers a large selection of ski pistes, from easy to challenging. Ski schools teach beginners and novices the basics. Experienced skiers can look forward to red and black pistes. 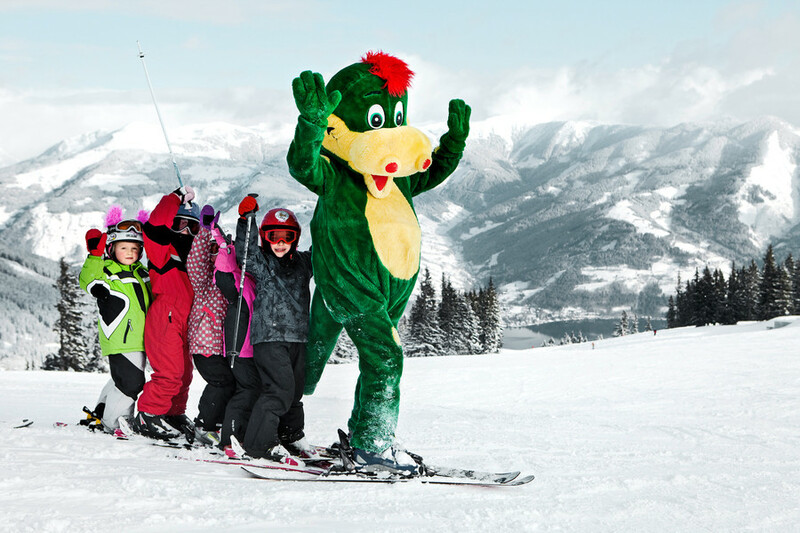 Kids & youngsters will enjoy the XXL Fun Slope, the snow park and Schmidolin - the cool dragon. Meeting point for hungry families are the many cosy huts. 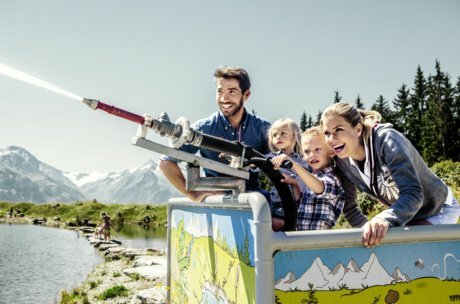 There you enjoy local treats and the unique views to the mountain world of the Hohe Tauern. In his international hit "Skifoan", Wolfgang Ambros also travels to Zell am See, "wei durt auf die Berg obn, hots immer an leiwaunden Schnee" (because there on the mountain is always the most beautiful snow). What our "Wolferl" forgot to mention is the extensive variety of pistes high above Zell am See. Blue pistes are ideal for beginners. 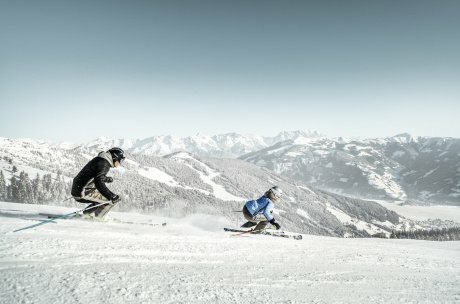 The red pistes stand for sporty downhill runs and the black pistes, the standard and the Trass piste, are perfect for ski sport pros. The pistes on the Sonnalm already offer sun skiing deluxe in the morning when other downhill runs are still in the shade, presenting themselves in compact snow for racy carving turns. NEW: This winter season the new areitXexpress starts operating. With more legroom, comfortable seats, ground level boarding and WiFi the areitXpress offers more comfort and quality to it's guests. Especially families are delighted by the Schmittenhöhe. 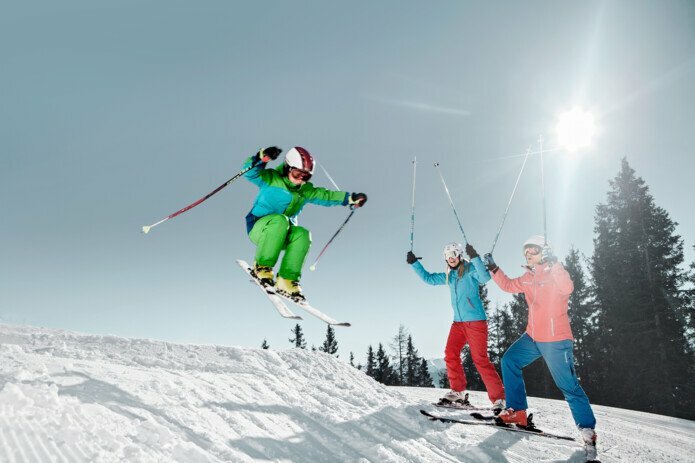 The youngest are well looked after in the children's ski course where experienced ski instructors teach them how to ski at the magic carpet and on the blue pistes in a playful way. Your kids and youngsters who only have fun & action on their mind can surely be found on the kids slope, in the snow park or on the XXL Fun Slope. The jumps, waves, banked turns and halfpipe will keep them busy for hours. And you? 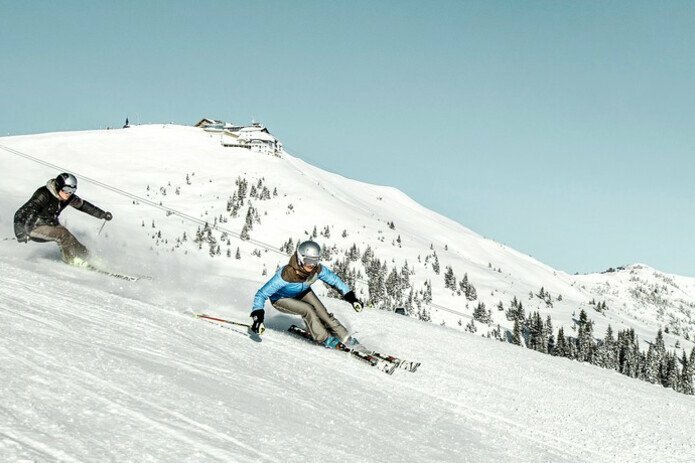 You carve across the most beautiful ski pistes of the Schmittenhöhe, enjoy the art on the mountain and look forward to a cosy break in one of the quaint huts and mountain inns. There you will meet your children again in warm, cosy surroundings and the entire family enjoys the region's tasty treats and specialities together. 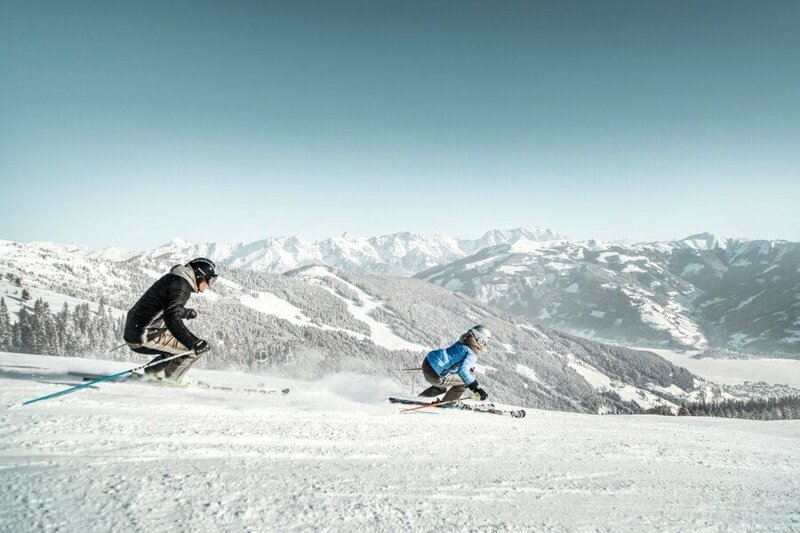 There is no doubt about it, winter sport has made the Zell am See-Kaprun region famous. But that is not all. A year has 12 months and plenty of highlights worth to be discovered are waiting here in summer. The interaction of mountain and lake emphasises its advantages especially in summer. 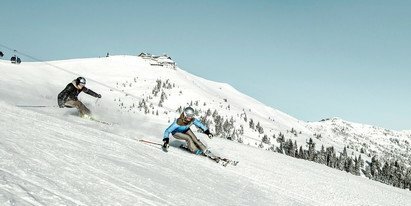 A first-class hiking region awaits in summer where skiers and snowboarders enjoy themselves in winter. For all and everyone, the programme is diverse; from leisurely walks, herb hiking tours to high-altitude trails and conquering challenging summits with stunning views and vistas. Thanks to the winter sport infrastructure and the ascent by a gondola in Porsche design, everything is possible. And it becomes "all inclusive" with the Zell am See-Kaprun summer card. "Come to see" - this would be a good motto for a hiking tour on the Schmittenhöhe. After the ascent by gondola lift, an awesome view opens in front of your eyes. Up to thirty 3.000 metres high mountains, all in the Hohe Tauern and the National Park with the same name, can be seen from the Schmittenhöhe. Join a herb hiking tour or climb a mountain summit, mountain guides and hiking guides show you the most beautiful places. Don't fancy the descent? Then take a paraglider into the valley. The Schmitten is a popular starting place for paragliding. 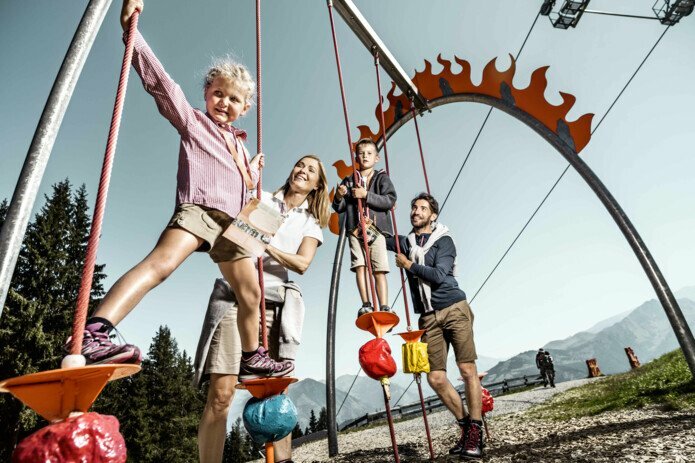 Fun and games at the mountain promises a round of disc golf on the Schmittenhöhe. Fancy a game? If the tranquillity and the view have not been enough yet, then you surely will fully relax with yoga on the mountain. Just like in winter, families love the Schmittenhöhe. Especially because here is something for every taste. The youngest become friends with Schmidolin, the cool dragon, and have fun at Schmidolin's baptism of fire. 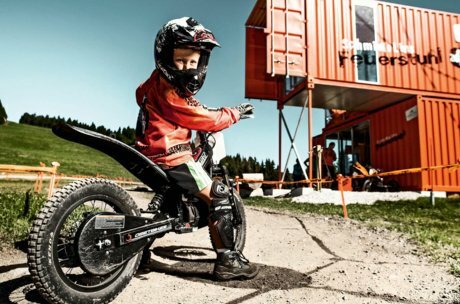 The older kids take a few racy rounds on Schmidolin's blazing motorbikes in Austria's highest-situated E-motocross park. Quickly, open Schmidolin's hiking puzzle magazine and answer his questions on the family hiking promenade high above Lake Zell. In perfect harmony with the great views, there are art installations to be admired on the mountain. They fit beautifully in the landscape and complement the stunning panoramic views to lake and mountain. 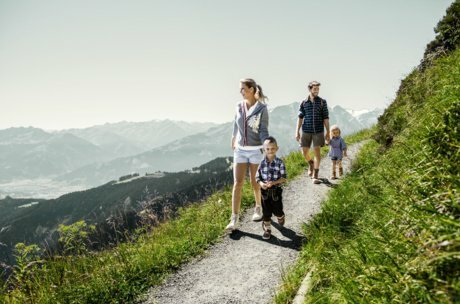 Have we convinced you that the Schmittenhöhe is a real highlight of the Zell am See-Kaprun region in summer and winter? Have you ever been skiing the Trass downhill run into the valley or has a hiking guide ever explained the thirty 3.000 metres high mountains, which can be seen from the Schmittenhöhe, to you? Then you should plan your next holiday. Best you book your accommodation in Zell am See now and spend your next summer or winter holiday in the presence of the Schmittenhöhe. For further information and more details, contact us directly!